While we shouldn't be shocked by anything coming out of Madison Avenue, part of me is incensed to hear Honda using Judas Priest to advertise its new Odyssey. That's right, the opening riff of the greatest album from the gods of heavy metal deployed, not in the service of Satan, but to sell a minivan? While the 18-year-old headbanger in me would like to stand up and rail against Honda ("If you think you're going to make me think your stupid soccer mom taxi is cool, well, You've Got Another Thing Coming! "), the truth of the matter is that Honda's ad agency nailed it. We're not teenagers anymore. We've grown up and had families. 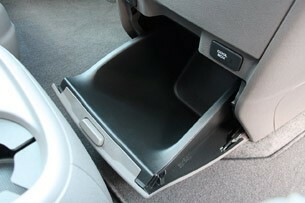 I even own a minivan, and, indeed, there is at least one Judas Priest CD that lives in the center console. And after driving the new Odyssey for a week, I have serious van envy. Honda has crafted the ultimate, state-of-the-art people mover, even if it's not much more than some flashy design and incremental improvements in areas like powertrain, fuel efficiency and equipment. The biggest changes in the redesigned Odyssey are obvious at first glance, as it no longer looks so much like a conventional minivan. Honda's ideas on styling have been polarizing as of late (read: the Accord Crosstour is ugly as sin), so it's smart that the company chose the Civic as the donor of the new minivan's face. The venerable compact is still the most complete and fluid execution of modern Honda design language, and what it lends to the Odyssey works to make Honda's largest vehicle appear smaller and sleeker. It helps that the Odyssey has a lower and much wider stance, having been stretched over two inches across. While its front and back sections don't exactly mate up well in profile, each works on its own. The flying buttress D-pillar helps the rear end achieve a more contemporary look, like that of many crossovers. Honda is calling the quirky jog in the beltline at the Odyssey's C-pillar a "lightning bolt," and it's more than just a clever device to give the vehicle a dynamic, moving-forward look. That little dip makes the third-row windows bigger and increases the feeling of roominess for passengers in the way back. Honda clearly wants to make the back of the bus a more desirable place to ride, and it's come up with some enticing new features to serve the rear-seaters' needs. The first is that the third row now has two sets of LATCH anchors, while the second row can be had with three. These carseat attachments mean more than horsepower to breeder parents, and the Odyssey has more of them than the competition. The second row is interesting in that Honda has decided not to follow Chrysler into its folly of designing seats to fold into the floor like those in the third row. 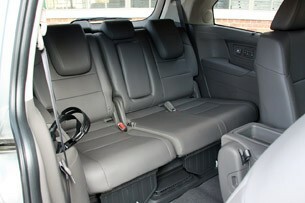 Understanding that it's the rare day when you want to use your minivan like a pickup truck, Honda instead designed a system that allows the second-row seats to be moved laterally to make more room for passengers or car seats, while improving third-row access through the center in the process. 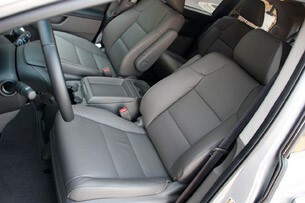 The optional second-row-center seat can even be moved forward to place an infant carseat closer to mom and pop in the front. This is smart engineering trumping gimmicky marketing. 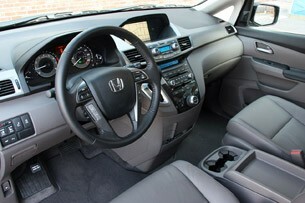 Up front, the cockpit is functional and the controls are similar to any number of other Honda or Acura vehicles (save for a dash-mounted shift lever). While having a central LCD display with a field of buttons and one large controller knob below seems to be the industry norm these days, it's unfortunate to see Honda abandoning the touch-screen interface that made its in-car navigation systems the class of the industry a decade ago. Also upsetting is Honda's decision to place the climate controls above those for the audio and navigation systems, a huge flaw when you consider that many drivers will set an automatic temperature setting and then rarely look at it. Behind the wheel, the Odyssey is a nice driver, though it no longer feels as much like an Accord. It's not that this new version of what used to be the best driving minivan on the market can't corner, but that the steering doesn't provides as much feel as its predecessor. 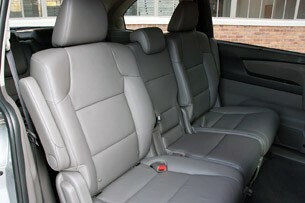 If the Odyssey drives more like a minivan than a station wagon now, it certainly doesn't accelerate like one. 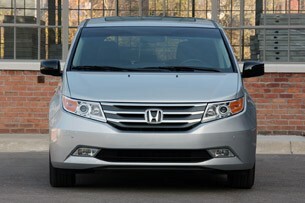 Honda's 3.5-liter V6 makes 248 horsepower in the 2011 Odyssey, along with 250 pound-feet of torque. It revs quickly and has great throttle response, and Honda has done a masterful job of matching the gear ratios of the new, optional six-speed automatic transmission to make the Odyssey move. This is a minivan than can go quicker than it should, at least with babies onboard. 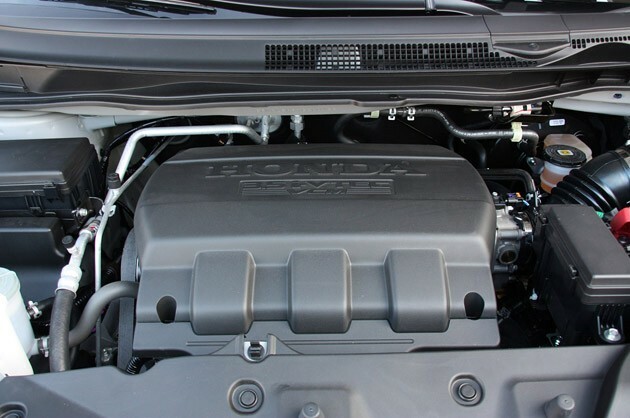 Honda has also included its Variable Cylinder Management (VCM) system as standard equipment. This shuts down two or three of the V6's cylinders when they're not needed, improving fuel economy. This and some other measures, including a 50-to-100 pound weight reduction, have helped the Odyssey boast some impressive EPA numbers for a roughly 4,400-pound vehicle. With the standard five-speed automatic, the van is rated at 18 mpg city, 21 combined and 27 on the highway. The six-speed automatic improves each of those numbers by a single mile-per-gallon, and that's tops among any vehicle that can carry eight passengers. No minivan these days would be complete without some sort of video screen for the kids, and Honda has gone big in this department with an optional 16.2-inch widescreen that folds down from the headliner in the second row. (A more conventional nine-inch screen is also available.) Before you get too excited about having a display larger than a MacBook Pro in the Odyssey, however, understand this is really just two normal-sized displays mated into a single, wide LCD panel. 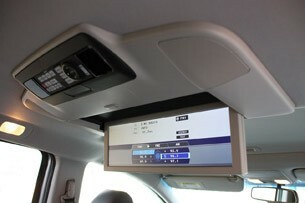 While it's possible to stretch out a single video source to cover the entire screen in a grotesquely distorted aspect ratio, the more useful application is to allow each side of the vehicle to select a separate input source for their half of the screen, choosing from the DVD player, composite auxiliary inputs and an HDMI port. While this HDMI port is bound to get video game geeks excited, it's more of a way for Honda to future-proof its van than anything else. The screen in the Odyssey is still pretty small, making most modern video games designed for widescreen, high-definition displays difficult. 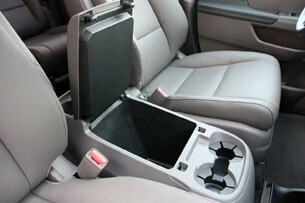 Your World of Warcraft addiction will have to be a lot more severe than mine to want to play in the back of an Odyssey. As much as I like the Odyssey, I do have three caveats that are absolutely worth mentioning. The first is an audio system that had issues outputting varying levels of distorted sound across all audio sources throughout a 1,000-mile roadtrip, making even podcasts unlistenable. I'm trusting the tester was merely defective, and that this isn't a widespread problem with Honda's Active Noise Cancellation system, which uses the audio system to make the interior of the vehicle quieter. 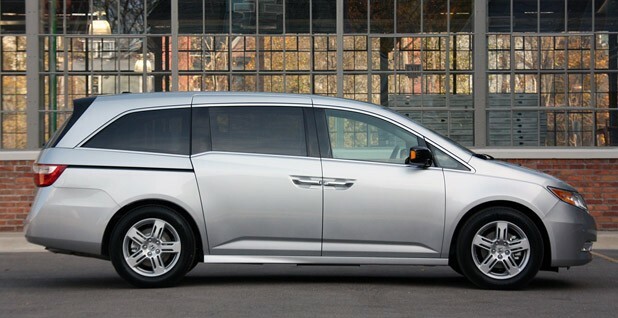 The second issue is an aesthetic one: Why can't Honda hide the Odyssey's door track? 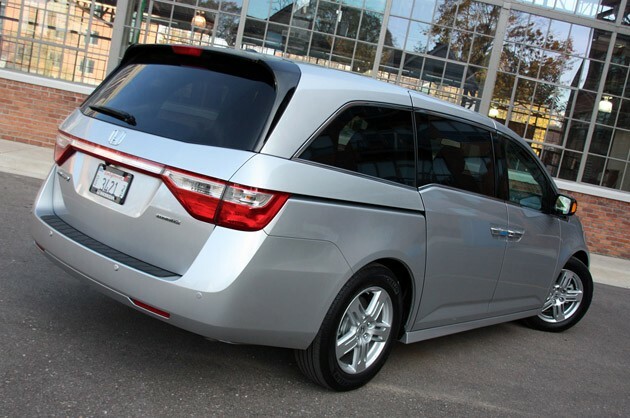 Honda knows the importance of styling, given how much its redesign of the Odyssey was based on making a van that looked different from any that have come before. 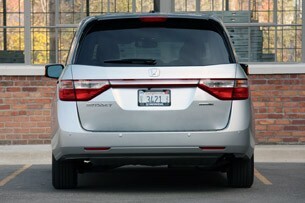 So why is it, then, that this company continues to allow these giant gashes on either side of the minivan to persist. 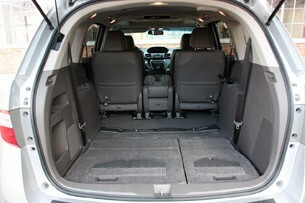 Toyota and Chrysler tuck their door tracks under the third-row window, and such a configuration would make all the difference in tidying up the Odyssey's busy rear, which looks too much like it has been on the losing end of a battle with a guardrail. My final complaint has as much to do with my own financial situation as it does with Honda, but $40,775 to get an Odyssey with the six-speed automatic seems a wee bit dear. That's an exceptional amount of money when the base model costs just $27,800. Whatever happened to paying an extra $1,500 for the better transmission? 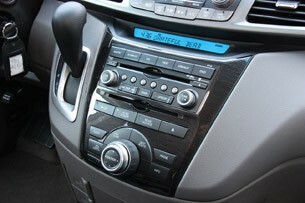 Why is the six-speed transmission bundled with a nav system and DVD player? This kind of business practice is akin to a cell phone provider offering a cheap plan with a token few minutes for thirty bucks, and then charging twice that amount to get enough minutes to actually use your phone. 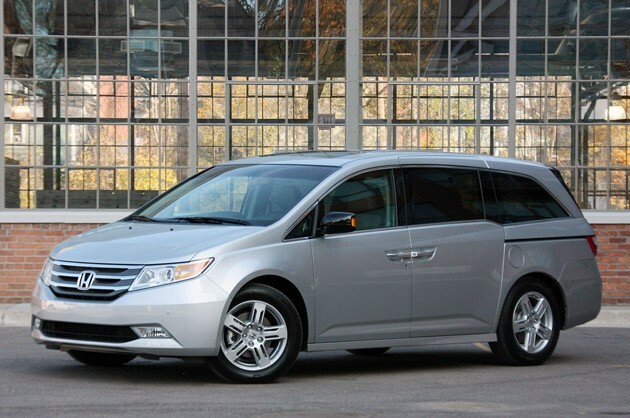 As fantastic as the Odyssey is, there's a bigger question at hand: Can it (or Toyota's "Swagger Wagon," or a nicely revamped Grand Caravan from Dodge, or the all-new Nissan Quest) convince the masses that minivans aren't the automotive equivalent of wearing sweatpants? Surely there are a sizable amount of people who wouldn't drive a minivan even if it came with a personal invitation from Rob Halford himself. 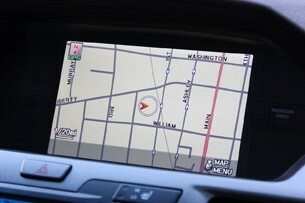 But Honda thinks that this market is primed for growth, and that's reasonable speculation. With plenty of consumers making the SUV-to-crossover jump in the interest of cutting their fuel bills while maintaining a capacious interior, giving minivans another look is the smart thing to do.